Claire Rice is a popular West Country artist based in Somerset. With a background in engineering design, she has been painting professionally for over twenty years. 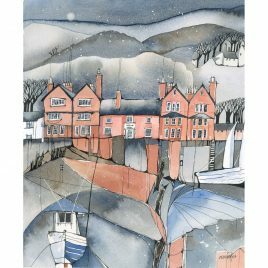 She works mainly in watercolour and ink, and occasionally with elements of collage. Taking inspiration from the people and places around her, the work is often brightly coloured, with an element of fun that reflects the artist. She often works as an in house painter in various galleries and welcomes observers. Her work appears in collections and galleries across the country.